Martin Shortis is a relatively unknown artist and teacher of a form that has been overlooked and forgotten in modern times. As a contemporary etcher working in the ‘90s and ‘00s Shortis must struggle to justify his medium to a public who have dismissed etching as limited and dated. However, Shortis’s art sends the message that the limitations of etching are also the strongest assets of the form. Etched art suffers from a primitive, two-dimensional look, and can only be colored black and white, but a master like Shortis plays off these aspects to create powerful and emotional pieces. He often represents shadowy human forms, taking advantage of etching’s tendency to make human subjects appear disfigured and almost lacerated. 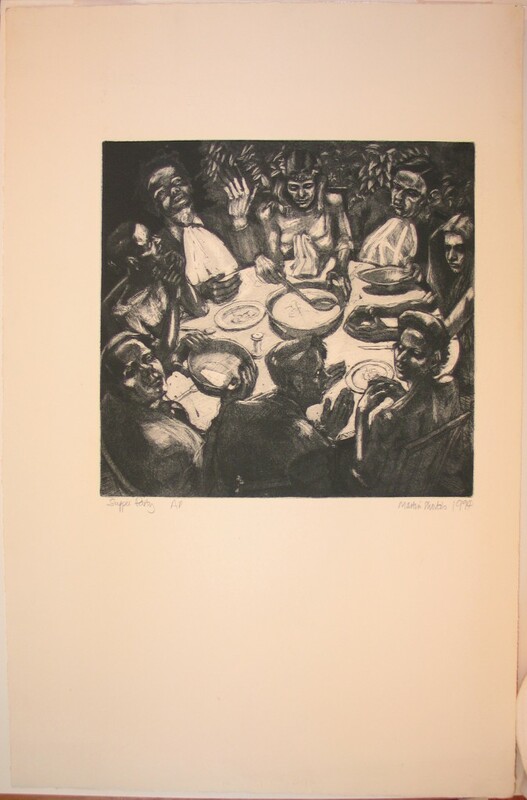 This style is exemplified in Supper Party (1994), a macabre depiction of consumption, where there is little distinction between who is eating and who is eaten. One of the most striking aspects of this etching is the ghoulish treatment of his subjects. The intense contrast of light and shadow complement pronounced cheekbones and elongated fingers to suggest a feast of the dead. Shortis uses this stark contrast in color as a parallel to the paradox of polite society. Like T.S. Eliot’s Cocktail Party, Shortis represents eating as an anti-feast. Similarly to Eliot, Shortis juxtaposes savagery with civilization, highlighting the brutal nature of genteel life. The focus is not on food and familiarity; the piece has a much more formal and hostile feel. The food is almost not present, and what little evidence of eating that is present in the piece is misleading and inconclusive. There are two plates, a few spoons, and a knife, but these items are so far forgotten that they are actually disappearing into the etching, some represented without perspective in a few barely visible lines. The woman in the center of the picture delicately holds a serving bowl and a ladle, but the ladle is empty and by the position of her arm she is not scooping anything, probably just toying with the absence of actual sustenance. The lack of food and festivity contributes to a darker view of the piece. Shortis creates almost a primitive scene- the contrast in the whiteness of the table and the darkness on the outsides of the scene suggests savages gathered around a fire. I feel that the piece overall has a very cannibalistic feel. The lack of food and the high tensions create a scene where everyone is watching, hungry, and waiting for a moment to pounce. Eliot introduced these cannibalistic undertones to his plan through the character Alex’s stories about savage rituals told during a high-society dinner event, as well as the ritualistic behavior of the Brotherhood. Both Eliot and Shortis thinly layer high society over these dark suggestions to expose society’s dual nature. Both the author and the etcher believe they are living an elevated lifestyle, but the truth remains that they are as much savages as a cannibalistic tribe. The one piece of food clearly recognizable in the etching is held by a man who seems to be looking directly at the viewer with a single cyclopean eye (the only clearly articulated eye in the entire piece). He’s holding what looks like a small slice of cake in a bowl, but by his gesture he is almost offering it up, out of the etching to the observer. He’s inviting us to the table. But who would join the savage scene only to be potential victims to these waiting cannibals. The man’s offer is not genuine; he wants to take more than he wants to give. He deceives. At this supper the cake is not consumed; the guests are. Eliot, T.S. The Cocktail Party. Orlando: Harcourt, Inc., 1950.